AGC MARINE and SmartShare Systems have tested a SmartShare StraightShaper Satellite 4000 to see how this would improve their VSAT connection. AGC MARINE TELECOM are specialists in the field of marine electronics and telecom. The company, founded by british Clive Widdowson, supply the naval market with high quality equipment, as well as taking care of installations and support. To complete their customers needs, the company also offers VSAT contracts that cover Europe, USA, the Caribbean, United Arab Emirates plus the Atlantic. The company, situated in Antibes at the heart of the French Riviera, naturally service a large amount of privately owned luxury yachts. These superior beauties demand first class equipment, as well as a first class service. Always looking for ways to improve their portfolio and services, AGC MARINE TELECOM invited SmartShare Systems to set up a test. They wanted to verify that SmartShare StraightShaper 4000 Satellite performed with an optimal User Load Balancing and improved the internet user experience on a VSAT connection. First test scenario is a simple test of website response time without, and with, a SmartShare StraightShaper Satellite. Test output for comparison: Time to complete the speed test. The same test was repeated multiple times, both without and with SmartShare. The speedtest.net web site showed 0.12~0.13 Mbit/s Download rate. Test # 1: 5 min. 52 sec. Test # 2: 5 min. 50 sec. File download vs. speedtest. Test without SmartShare: This screen shot from the SmartShare GUI, was taken while “tech01” was in the download phase of the speed test. The “Top Users by Download Rate” pie shows that, without SmartShare, “breneer” (the PC downloading 10 files) is taking 63 % of the total bandwidth, and that “tech01” only gets 37%. The speedtest.net web site showed 0.20 Mbit/s Download rate. Test # 1: 4 min. 10 sec. Test # 2: 4 min. 06 sec. Test # 3: 4 min. 12 sec. File download vs. speedtest. Test with SmartShare: This screen shot from the SmartShare GUI was again taken, while “tech01” was in the download phase of the speed test. 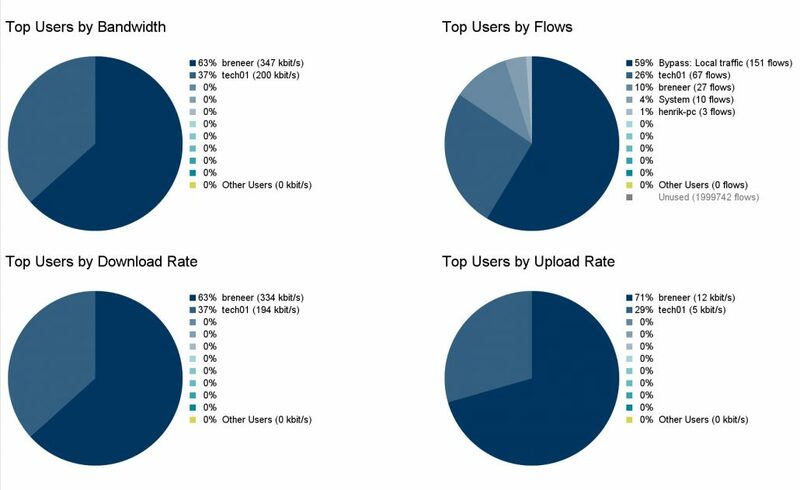 The “Top Users by Download Rate” pie shows that, with SmartShare, both users get 50 % of the total bandwidth, regardless of “breneer” downloading 10 files. The speed test completes in approx. 4 minutes, with a SmartShare StraightShaper Satellite in approx. 6 minutes without a SmartShare StraightShaper Satellite. This is a significant user experience improvement. Note! The total time it takes for “breneer” to download the 10 files is not affected. The Weight per User feature allows you to configure individual IP addresses, IP ranges or IP subnets to be granted relatively more bandwidth if necessary. E.g. the captain’s PC must be able to access the weather report or other important information quickly. In this test scenario, the IP address of the captain’s PC (represented by the “tech01” computer) is given a weight of 4, meaning that the SmartShare gives the captain 4 shares of the bandwidth, while it gives other users 1 share of bandwidth each. The test is executed like before: “breneer” downloads 10 files, and “tech01” runs a speed test. Effect of the weight per user feature: This screen shot from the SmartShare GUI was again taken while “tech01” was in the download phase of the speed test. The “Top Users by Download Rate” pie shows that – with the weight of 4 – the captain’s PC (192.168.1.52) gets 80 % of the total bandwidth (4 of 5 shares), and the other PC gets 20 % (1 of 5 shares). The speedtest.net web site showed 0.32 Mbit/s Download rate. The time to complete the speed test was not measured; but the higher download rate clearly indicates that it was faster. With a SmartShare StraightShaper Satellite, user-based weights can be configured to provide more bandwidth, to more important users ,at the cost of providing less bandwidth, to less important users. Now, the connection download bandwidth is 400 kbit/s. 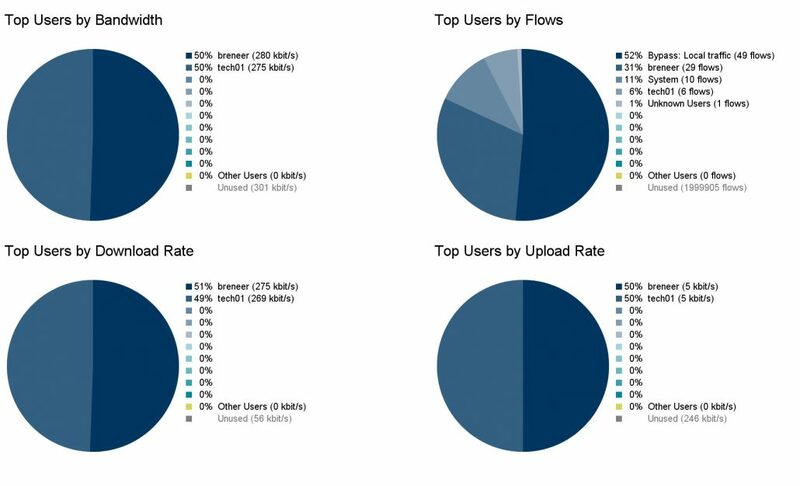 Again, the download bandwidth distribution shown in the SmartShare GUI pie chart, was noted during the Download phase of the speed test. Timed out, unable to complete. Ordinarily, one heavy user can take nearly all the available bandwidth, rendering the connection practically useless for all the other users. With a SmartShare StraightShaper Satellite, all the users are ensured access to the bandwidth, regardless of what the heavy users are doing. This is a significant improvement. Note! The speed test completed in approx. 4 minutes like it did in the 10 file download test with the SmartShare. This shows that the SmartShare has the same effect, regardlessly of a user downloading 10 files concurrently or using BitTorrent to download a very large number of files concurrently. With SmartShare there was enough bandwidth to run a FaceTime session with good video and audio quality (smooth video and no sound fallouts). BitTorrent download vs. FaceTime. Test with SmartShare: The “Top Users by Download Rate” pie in this SmartShare GUI screen shot, shows that the “henrik-pc” running BitTorrent got more than 50 % of the total bandwidth, and the “breneer” smartphone running FaceTime only used 163 kbit/s. This is simply because FaceTime did not require 50 % of the total bandwidth, so the SmartShare gave the excess bandwidth to the “henrik-pc” running BitTorrent. Without SmartShare the bandwidth for the FaceTime session was under pressure from the BitTorrent session, resulting in poor and sometimes missing video and fallouts in voice. See the video and experience the FaceTime session. See more videos from SmartShare Systems. When one user is running FaceTime, and another user also is active, the FaceTime user experience is improved by the SmartShare. For simplicity, the test scenarios were examples based on only two users. 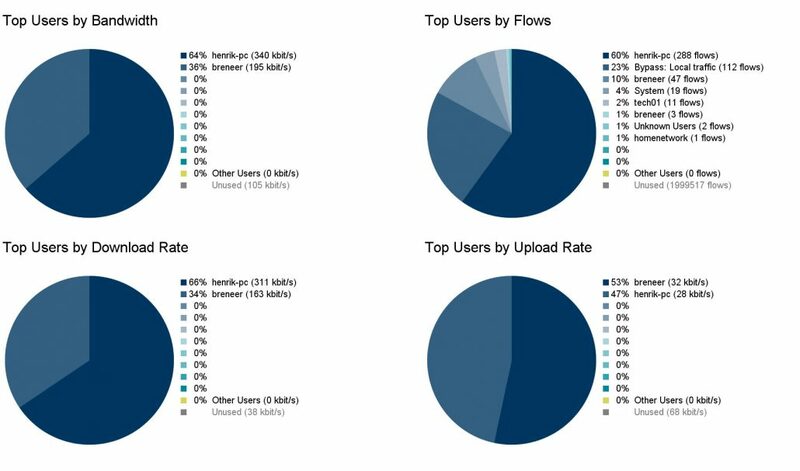 It showed how one user doing something, would normally degrade the other user’s user experience significantly, and how the SmartShare improved the situation. 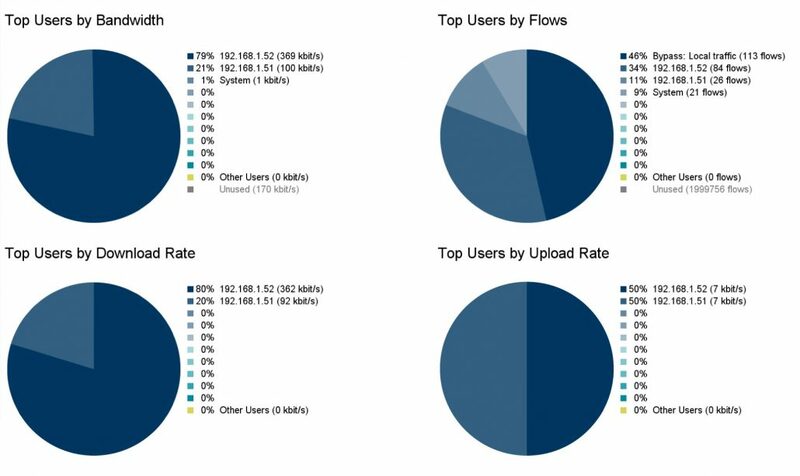 In real-world deployments, more than two users will be affected, and in many other situations than these few tested scenarios, SmartShare will optimize use of bandwidth as well as user experiences.